Yep. It's a party pack of wonderfully coloured balloons. Just the thing to brighten any small child's social function. What the hell do they have to do with guitar making, though? Well, a balloon can be pretty useful. I've picked a nice orange one. Pretty. The thing is, when you're finishing an acoustic guitar, the last thing you want is to get stray lacquer spray inside the guitar. That looks really messy. You could, painstakingly, mask off the soundhole with tape but remember, that has to be done on the inside of the top so you can get finish on the edges of the soundhole. Who has the bloody energy for that? Nope. Far easier to pop a balloon through the soundhole and blow it up. That's what the image on the left is. It's not some weird, guitar prolapse, it's a balloon poking out of a soundhole. It's a good idea to cover the balloon with something (a piece of card covered with packing tape in this case) as the lacquer can pop the balloon and then you're straying into the realms of '70s sitcoms about guitar-making. Nobody wants that. Incidentally, in the photo on the right, the guitar is held in my new Stew Mac Guitary-Holder-Thing. For all intents and purposes, it's just a bit of bent pipe and is definitely the sort of thing that wouldn't be too difficult to make yourself. It's also one of those things that you never seem to make yourself so I bought one. I like it a lot. It makes this sort of spraying a lot easier. 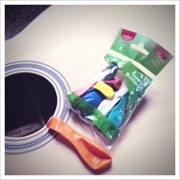 So there you go: Acoustic guitar finishing and balloons. Next week, pickup rewinding using the front axle of a Fiat Punto and some leftover sausages.